The story of this magic-making, big cat-taming duo splendidly spins with all the glamour and glitter you'd expect of these Las Vegas legends. Beginning in W.W.II Germany, the history of each man plays on the screen in a surreal reenactment as if seen through a snowy-glass ball (make that a crystal ball). The film focuses on these boys-to-men at selected stages in their lives, from childhood, to their meeting while working on a cruise-liner, to their ultimate life's work crescendo. As not to keep us from waiting too long for "the big show," flash-forwards of their current Las Vegas spectacle are interjected into the tale. Roy as a boy falls into quicksand, a raven flies above, his trusty dog gallops off for help, a huge mechanical clock superimposed into the cloudy sky ticks as he slowly sinks. Behind him are multiple backdrops for depth, cardboard cutout corn stalks etc. ... revisiting the spirit of "The Wizard of OZ." Siegfried as a teen rides his bicycle through a computer caricature of Munich. The recreation is eerie, like a remembrance, surreal like nostalgia and fluid, in a way an actual memory might flow in our mind's eye. 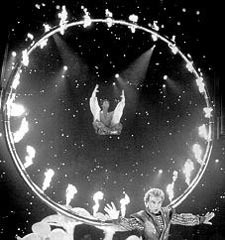 Many 3D productions use the effect to project objects out into the audience, this picture quite magically uses it to draw the viewers into the production. Well cast and well directed are the younger Siegfried & Roy, believable and likable despite the potentially overwhelming familiarity of their elder counterparts' faces and fame. A heartwarming ending sets the boy duo in the audience alone applauding their older selves wrapping a smashing show. Look for a gear and cog visual motif that provides a unifying thread while keeping a disciplined pace to the production. Also interesting, in the ship ballroom performance scene, notice that only the foreground diners are real, the rest of the table people in the back are cardboard cutouts. Done in another production it might have looked cheesy, but here, it's charming. They even stand up for the ovation. Lastly, special effects at every turn of the page sparkle like the star-studded backdrops. It's a real entertainer that aspires to set spinning childlike wonder, adventure and appreciation for the oft-forgotten beauty that surrounds us daily on our little planet. When you were young did you ever think you'd have a job that required you to ride a white lion? A brilliant piece, especially with a ticket price somewhere around one-twentyth of the Las Vegas show ... you'll probably have a better seat too. 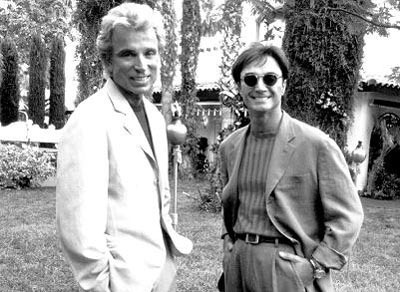 Siegfried and Roy: The Magic Box in 3D. Copyright © 2000. Starring Siegfried Fischbacher and Roy Uwe Ludwig Horn, John Summers and Andrew Dunlap (Teen Duo. ), Dillion McEwin and Cameron Alexander (Young Duo). Written by Lyn Vaus & Brett Leonard. Produced by Michael V. Lewis at L-Squared/Imax Corp.